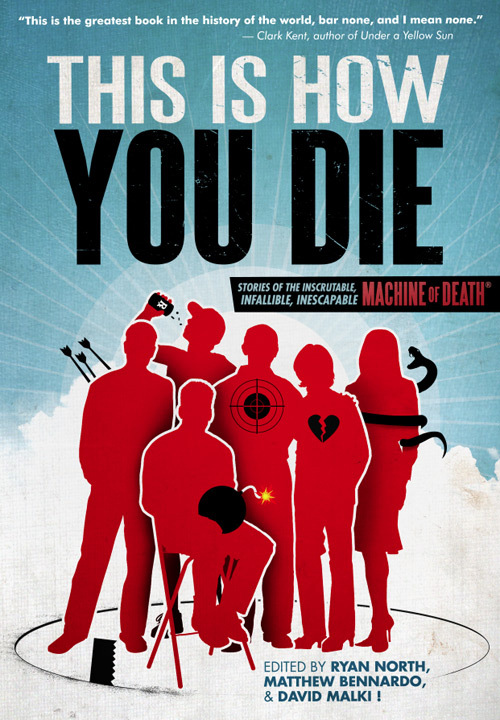 This Is How You Die is the follow up to the enormously successful, internationally famous Machine of Death. My story, Your Choice, made the cut despite going up against over 2,000 submissions! This is both amazing and very humbling, and I’m absolutely delighted to be a part of this ongoing phenomenon. Mine is a choose-your-own-adventure style story, but more than that I can’t say. It was a blast to write, though it took a lot of effort to get all the various moving parts lined up. I’m delighted that editors Ryan North, Matthew Bennardo and David Malki really got it and liked it enough to include it in their exciting lineup. The cover is by Justin Van Genderen. The book was published on July 16th, 2013 by Grand Central Publishing and debuted at San Diego Comic-Con! Funny, frightening, clever; no one in these stories emerges unscathed. I heartily recommend you check this anthology out. I found it to be well worth my time, despite going in expecting something far darker. I think you’ll be pleasantly taken with the variety of stories that will leave you wondering what you might do if a machine could tell you how you would die. And lastly, for now, the AV Club with a stunning 5-star review! […]what is consistently surprising about This Is How You Die: Stories Of The Inscrutable, Infallible, Inescapable Machine Of Death is the range and quality of the stories. This Is How You Die keeps the intellectual curiosity and empathy, but its variations are anything but minor. And another mention for “Your Choice”! On top of this, two 5-star reviews have already been logged on Amazon.com with a few more on Goodreads. Exciting stuff! Here’s where you can order your copy of This Is How You Die. Keep checking the Machine of Death site for more information!